Create custom forms using the standard Concrete5 form block and Legacy Form block in 5.8 that have field labels inside text fields or text areas in a table-less block that are easy to style and responsive ready. This add-on is perfect when you need to fit a text field and it's label into a limited space such as a sidebar. 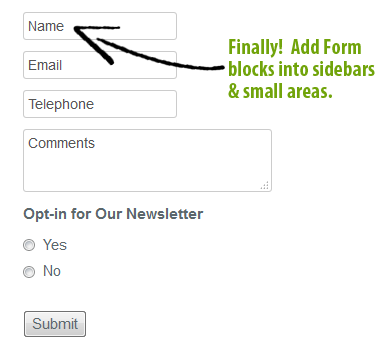 To apply the custom templates that come with this add-on you simply create your form in Concrete5 as you normally would, then, while still in Edit Mode, click on the form block and choose Design & Custom Template. Then click on the gear icon and in the Custom Template select box choose the label inside template. When you apply the Label Inside custom template the field labels will be put inside the field for text and text area fields that have been applied to the block. When you click inside the text fields the labels will automatically disappear. Note: this add-on is not compatible with the new 5.8 version Form block, but is compatible with the Legacy Form block in version 5.8.